Today I am sharing the recipe of Pathiri / Rice flour pancake. 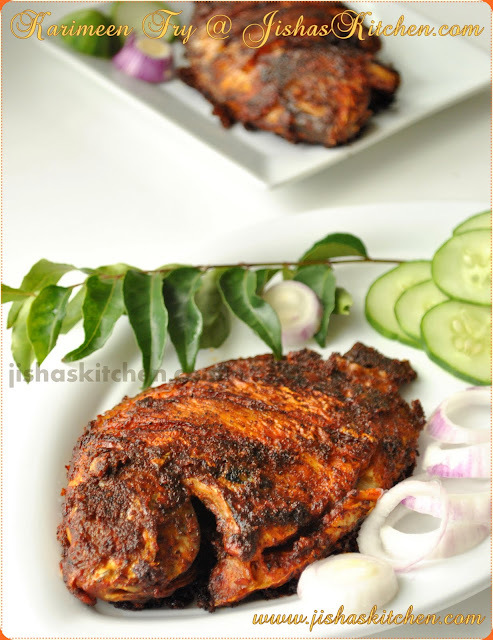 Its also known as Ari pathiri and is very famous among the Muslims of Malabar. I know some Muslim families who stay near to my grand parents house back in Alappuzha, Kerala and during their festival season they used to bring us Pathiri along with spicy mutton curry,and to be frank on that day I wont even eat breakfast from my home, because I will be waiting for them to bring those delectable spicy curries along with pathiri. Actually in our place we call pathiri as " Orotty ". I love to have Pathiri by just soaking it in sweetened coconut milk rather than having it with some meat curry. I found this recipe in Ummi Abdulla's Cookbook and prepared it on last week-end. First boil water by adding enough salt and when the water come to a rolling boil, add rice flour and then make a hole in the center of rice flour by placing a long handled spoon in the vessel. Cover it with a lid and keep it in a low flame for just one minute. Remove the lid and stir till it is well mixed and then remove from the flame and allow it to cool. When the dough is still warm, knead it to a soft dough without adding any water. 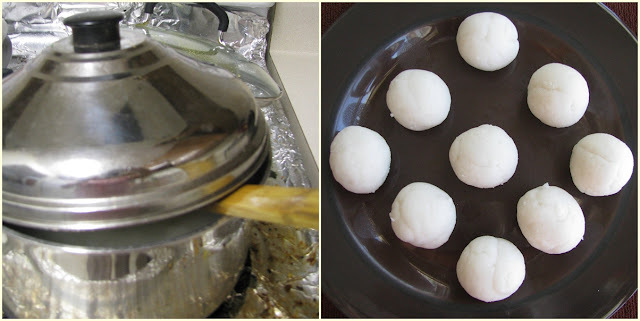 Then make small balls out of it and then sprinkle rice flour and using a rolling pin roll out the balls just like chapathi. 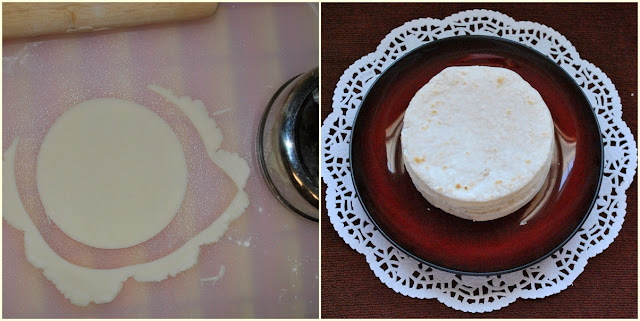 Try to make it, as thin as possible and then using a round cutter or a round aluminum lid cut out the edges which will help in getting an exact round shape. Then heat a tava and place the pathiri on it and turn it over after a few seconds. Repeat this one more time and when the pathiri puffs up, remove it from the tava. 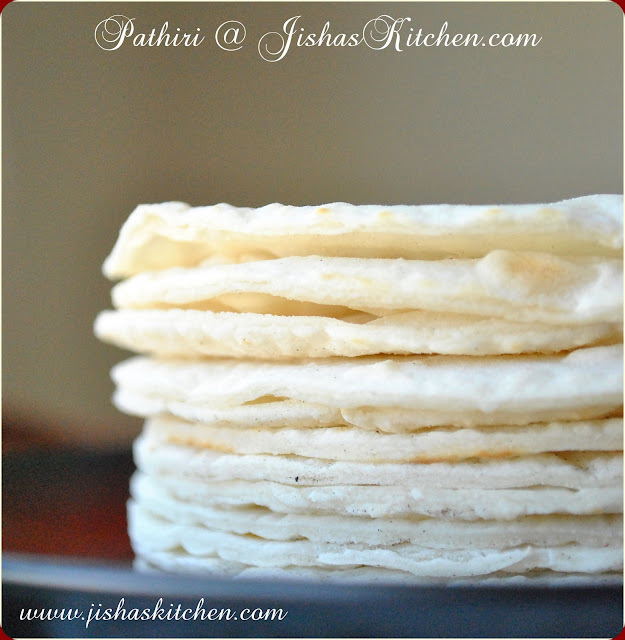 Before serving apply little coconut milk on one side of each pathiri, this will enhance the taste of the pathiri. Enjoy with Chicken curry / Mutton Curry. rice flour and coconut milk together sounds yummy!...this one looks more like chapathi...will try it sometime! 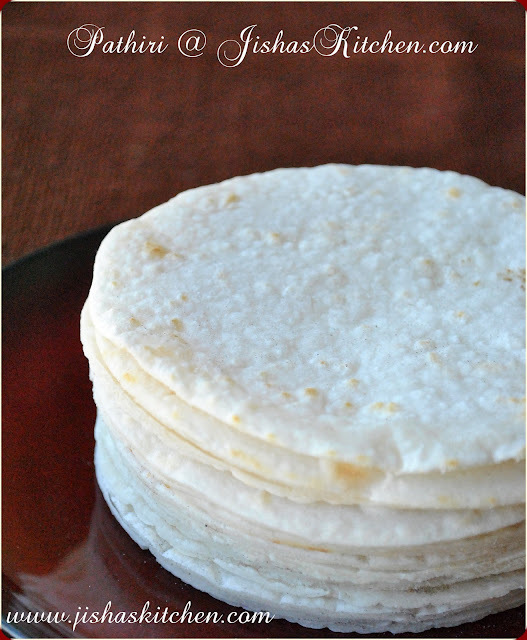 wow..absolutely delicious rice flour pancakes//...loved it ! Pathiri adipoli. kandittu kothi varunnu. This is new to me !! Looks so delicious !! This is one of my fav fav thing...Adipoli aytundee..
Pathiri looks excellently prepared. Great meal. 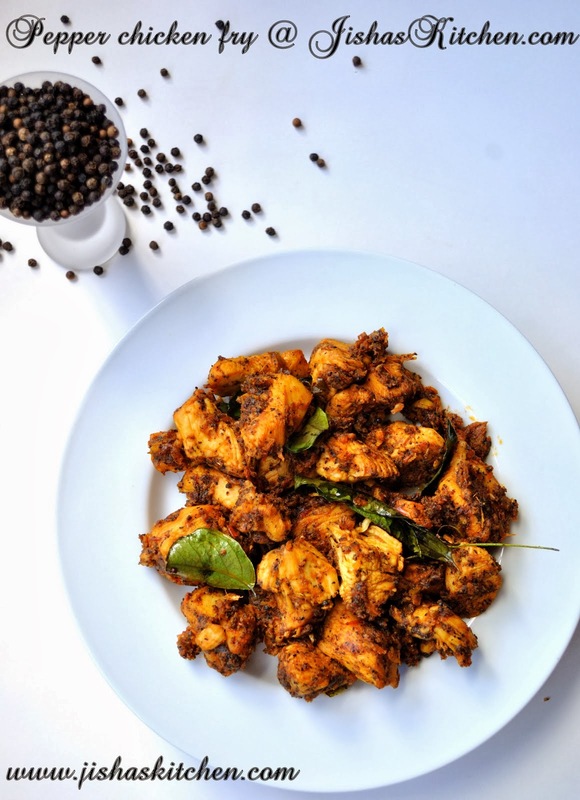 After reading the writeup, I really want to have some with spicy chicken curry! Looks really good! jisha...i should tell you that pathiri and mutton curry is my absolute fav breakfast dish..its been ages since ive had some. Pathiris looks super prefect and beautiful prepared..
Wow this looks perfect and tempting.. This is new to me and sounds very delicious,looks lovely too! well presented!